Thread: I am done with Crank Brothers! I have been rocking the crank brothers Mallet pedal for four or five years now and I am just done. The cleats wear too fast (or my springs are shot on pedals that are only 1.5 years old, which I doubt) and I replace way too much and they always release when I strike them on the top of a rock. That happens a lot here in AZ. The eggbeater design is great for shedding mud, but as you all know, that doesn't really matter here. So, what should I switch too? I was thinking the Shimano SPDs with the resin or metal cage, but I have never used them before. Does anyone have experience with those? This is for a Titus El Guapo so I tend to ride through pretty technical terrain (national, geronimo, holbert). Or is there another brand people might recommend. Sorry Crankbrothers, but I am just tired of my foot coming out of the pedal! Last edited by PrincipalRider; 01-17-2011 at 05:47 PM. Flats. If you must clip, I always preferred Time to Shimano as I found my feet popped out less from rock strikes. The cleats are brass, though, and do wear pretty quickly. Yeah, I do flats on my downhill bike but I am a spinner. I need clips for climbing. Shimanos are awesome. I saw that there is a new XTR Trail pedal with a large platform for standing when not clipped in - that could be a good possibility for you. I've been riding the Time ATAC's since they came out years ago. I have the ti carbon ATAC's on my superfly 100, they work perfectly. The Time's have a 3 position tension adjustments for the spring, so you can fine tune your clamping load on your cleats, if you need more clamping force to retain your shoe. I have Shimano XTR on my EG. These pedals take a beating. I don't think very many of these posts have tried to address your concerns yet. There are those of us that are used to clipless pedals. There are those of us that do just fine while DHing in gnarly terrain. There are plenty of skilled riders out there that do the same. Yes, shimano makes some good SPD pedals, the latest generations have some improvements for mud shedding. The 647 uses this new generation of mechanism, but I found that the arizona rocks can still kill the resin cages. They aren't terribly expensive though and if you don't mind replacing every once and a while, there aren't any other weak areas and you'll have a hell of a time trying to kill the mechanism or bearings. The 545s are the older pedal and were originally meant to be a "lesser" option compared to the 646s, the all-metal cage could take a beating though and they quickly jumped in price when they became much more popular. They were also lighter than the modular-cage 646s, although there are a lot of diehard 646 fans. These pedals can take a beating and I've had people tell me (in norcal) that they saw sparks flying off the pedals when I smashed into rocks with them. These last WAY longer than any CB product that I've tried. The 545s have one weakness, a screw-sleeve that fastens the cage to the pedal mechanism. If this breaks, the pedals still function, and it IS reparairable. I started reparing this by ordering the "end cap kit" or something for the pedals and now they last me a long time (plus I can keep them going). The time dh/fr/am platform pedals get great reviews (I haven't used them) and seem to be a worthly replacement if you like the crank-brothers type mechanism. Personally, I far prefer the shimano mechanism that is based more on spring tension rather than angular deflection (for release). Crank brothers pedals were always highly unpredictable for me in this area, they could be impossible to release unless your foot rotates enough, which can be difficult during some falls, add to this the exceptionally fast wearing of the cleats and you can bang your knee into the bars or sometimes be locked in and unable to get out. Not everyone is a fan of the shimano mechanism, but it's reliable, the spindles, mechanism and springs don't just randomly break like CBs, and they've improved mud clearing and weight quite a bit over the years. I was done with CBs a few years ago, due to several snapped spindles, broken wings, pedal body falling off the spindle due to shoddy design, unpredicable exit, unable to adjust tension, difficulty clipping in during difficult terrain, and so on. Me and my girlfriend have been using these for a couple years now, with not a single problem, and they have gotten beaten pretty good on rocks. I like technical rocky climbs, so my pedals get beat. Sharon tried a pair of Crack Brothers Candy-C pedals before the Shimano's, and they were beat to hell in a month, and then would not release her foot consistently. Pure junk IMO. I know the mallets are a little better than the Candy-C's, but she also had the problem with rocks releasing her feet. The 647 has excellent release. If you want to get out even easier, use the multi-release cleat (SH-56) It may release too easy if you are a hucker, and throw the bike around in the air. For technical trail riding they work great. Try Time Z Pedals. Similar to CB Mallets and can take a beating, I have been running them for close to ten years on various bikes and currently have then on my Sultan. Looks like those have had a long hard life! Time to get some new pedals & dig a deep hole to bury those in (or save them to use as decorations on next years trail Christmas tree). A couple things to consider. Do you need a big cage to stand on when unclipped? I've never been able to stand on them when unclipped. A good pedal to shoe interface makes more of a difference then the cage size. I tried Mallets and Candys for 4 years trying to get a better platform. I gave up six months ago because I was tired of dealing with the sole to pedal tolerance discrepancies with different shoe models. The only thing I miss is the extra float. I move my feet around alot when cornering and tech climbing. Also my feet tend to get nocked out of the pedal from hitting rocks along the side of the trail. Eggbeaters for 6 years, no problems, occasional broken cage. 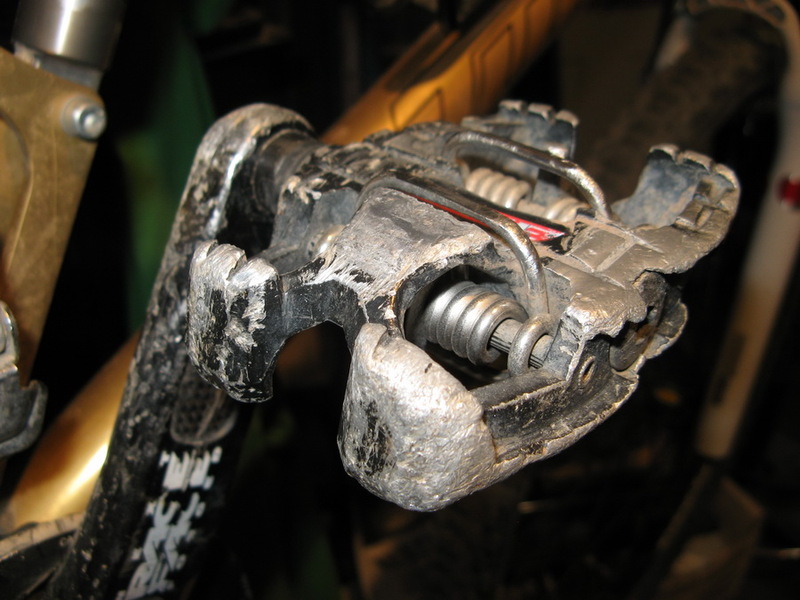 Most pedals developed bushing play eventually, and there was little you could do about it. Switched to all Shimano LX/XT/XTR level stuff with no extra platform on them. Very durable. Cleats wear possibly faster than the CB stuff due to being more raised from the shoe. Release and entry is not as good as CB. You can totally rebuild the bearing system which is nice. Overall, I can't say I have a favorite. I think the Eggs were functionally better, never liked the Candys at all. All the CB horror stories and personally witnessed several broken CB axles has me sticking with Shimano for now. Speedplay was total junk IMO. Very inconsistent. I never even got those on the trail one time. I need to try flats with all the walking I do. I find the cleats make the shoes pretty skittish in the rocks. I've never tried Time pedals but have been tempted. I do think it would be hard to go wrong with Shimano though. I use the 647's (with a resin cage) and they are awesome. The cage does not interfere one bit with clipping/unclipping and although the resin gets some gouges in it from rock strikes they still work perfectly. I ran 540's for years (no cage, basically same pedal otherwise) and liked those just as much. If you like to land some drops the 647's with a cage might be a little better option as they give you more of a contact patch under the shoe. Having tried them all on south mountain, there is no better option than a Shimano. They are strong pedals..and you can trade bikes with your friends. I need clips for climbing. That's like saying "I need gears for climbing." Been riding the new XTR trails and love em. . . can feel the lower profile / contact with the cage and love the clip fel. Coming off of a 3 year old beat to shite pair of Time Z's. Been running CB's for years, I like them but I'm tired of getting unclipped when I pedal strike, so I just got a set of the Time Z's, so far so good...they appear to be bullet proof...Other than pedal strike clip-outs, I cannot fault my CB Acids (or candy's), they are old and abused and still work fine, I never even had to pull them apart yet. Last edited by 5bravobravo; 12-29-2010 at 02:04 PM. I have tried SPD, Time ATAC and Speedplay Frogs. I eventually settled on the Frogs because of the amount of float and have been running them for the last 4 years. The major problem I have with the Speedplay is that the cleats wear out very fast and are expensive to replace. I really liked the Time ATAC but I experienced some knee pain so I switched to the Frogs. I recently switched from SPDs with a metal cage when I finally broke one. The only problem I've ever had with shimano pedals is the screw that holds the spring in place will come loose. I have had this happen twice and it is a PITA to get it back together. I now use Azonic 420 pedals and Five Tens shoes. After recently tearing a pedal from a crank arm (I'm fat) I was still able to one-footed pedal the bike like I could if I were clipped in. If you want a leg work out- try this for a coupe of miles ! You people and language. Okay so I prefer clips for pedaling! I am slow enough as it is and my knees cannot handle the mashing so I have tried to develop a spin just like lance! Anway, maybe I will give the Shimano's a try. Now that I think about it, my first road bike came with an SPD copycat pedal and it was not that bad. I bent a rail on my Time after 6 years and it still worked perfectly but sent it in to rebuild it, $40 and back with a week. The cleat on you Crank Brothers is similar and may work. Those are the biggest POS ever made!! My girlfriend got those, and even her 140# just beat them to hell in about a month, and she would get hung up because the bars were bent. Total crap. The 647 has excellent release. If you want to get out even easier, use the multi-release cleat (SH-56) It may release too easy if you are a hucker, and throw the bike around in the air. For technical trail riding they work great. 5 broken CB pedals in 5 years. No broken Shimano pedals in 15+ years, and many more rides overall. I have broken CB cages, spindles x2, and bearing races, and suffered the afforementioned ejections when knocking rocks (Mallets, Candies, and classic Eggbeaters. And yes, the Smarties are absolute trash). I tried flats, but I am too XC to buy in to them on anything more than my coffee shop cruiser. I am back to Shimano and very happy. Mashing doesn't actually hurt your knees, it's the fact that your hamstrings and hip flexors are not developed enough (probably from years and years of spinning) which then causes you to engage your quads too much. Since your feet are connected to the pedals when you mash you are actually putting unnatural forces on your knees which is why you have to spin to prevent the knee pain. Flats will actually help correct this issue. Standing and mashing will help you fix it faster! Me and my girlfriend both use the multi-release cleats. You don't lift your heel to get out. In fact, you don't really do anything special. You just put your foot down, and it happens. You can pull your foot straight up on them and get it to come out that way if you yank fairly hard. It is more like they just don't have to have the full heel twist to get out of. Just the natural motion of moving your leg and foot to put it on the ground disengages you. It is extremely intuitive. Yet I can pull backward, or push forward just as hard as I want to without the foot coming loose. But even coming to a stop on a technical climb, my foot is on the ground in an instant. Just about as easy as dabbing with flat platform pedals. I used to ride toe clips/straps, and never got used to any clipless pedals I tried. Then I tried platforms and 5/10 shoes, and my foot came off when lunging up steep rocky climbs. With the 647 and multi-release cleat, I get the power of clipless, and the ease of dabbing of platforms. +2----Somo will kill pedals quick , I also tried all the pedals out there and ended up right back to XTR's. I could break any of the CB pedals in one Somo ride--( really week pedals) not to mention I hated their design so when you bump the bottom of the pedal and hit the wire bail on anything it releases the top . The Times would just break in half and or bend the bail and they would not hold correctly. I just got the new XTR Trail pedal and I just love the thing , the outter platform really seems to add stabilty and protection . I picked up some SPDs and will stick to the flats for the DH bike and the fixie. Thanks for the advice all. I love my crank brothers pedals. I used to run xtr's and switched to cb more float, lighter, and cheaper to put on all my bikes. Cheaper in all ways. Unfortunately, not just in price. What can I say? I gave CB a good five years and every problem that people talk about I have had. I have broken spindles, cracked the loops and springs on rocks, and the worse thing about them is that you hit a rock and the damn things disengage. I will try Shimano and see how they do. Another strong vote for time Z's - I've used them all and only the Time Z's survived. That being said I'm on flats now. It's a lot tougher to climb obstacles on flats now that I can't "cheat" by pulling the bike up with the crank, but my form has gotten a lot better. It forces you to ride properly. A bonus side effect is I can now (kind of) "bunny-hop-while-manualing" over stuff because it forced me to learn how to pop the bike over stuff while climbing. There may be some truth to the nickname "Fail Brothers", as there are quite a few people I ride with that will no longer use their product, pedals or wheelsets. Kicked the CBs a long time ago. Tired of the hot spots, knee pain, black and blue shins, and unpredictable releasing. My frogs are far from perfect but really reliable and comfortable. Sometime I sport Time ATACs, which are very heavy but offer a great platform, foot support, and top notch reliability. I also think the name "Crack Brothers" fits quite well. I will say my experience with CB c/s in the past was very good. I started on CB Eggbeaters and I could not get used to the release on them. I emailed or called CB and they suggested I grind the cleats a bit for a quicker release. Then the guy said, "you know what, I'll do it for you and send them out". A week later new, 'custom' cleats found their way to my mailbox. Nice experience for sure but in the end I never did really like my EB or Mallets and moved to Shimano. Have not looked back since. I am a Speedplay Frogaholic. All pedals mentioned here work the same way. Whether it's a "bar" style Time/CB or a "clamp" style Shimano/other "spd" they both work the same way and if you hit something hard enough you will get released. I can't run anything but Speedplays. I have tried Time, Shimano, CB, etc... but would always release when I don't want to whether it be in mid air jumping or smacking a rock. All those styles will allow a vertical release. Speedplay won't release unless you twist far enough to disengage the cleat. Now that being said, there is always a downside. The Speedplays are more easily re-built, and will need it sooner than other pedals even when you use their grease port to keep things fresh. Earlier versions of the Frog had a less durable cleat, but the newest ones are better for durability. I have busted a few Frog bodies, and smash rocks all the time, but haven't busted one in a couple of seasons. In my opinion, for SPD style, you can't beat Shimano. Even their cheapest M520 bearings/spindle and body will outlast a CB any day. I do run Shimano on my commuter, but for offroad it's Speedplay all the way. The only other pedal that won't allow a vertical release that I know of is the BeeBop style, but I think it's called something different now. My favorite bike is whatever I am riding. My favorite trail is where ever I am. Bikes and equipment are replaceable, friends and trails are not. All pedals mentioned here work the same way. Whether it's a "bar" style Time/CB or a "clamp" style Shimano/other "spd" they both work the same way and if you hit something hard they release. Actually no, they don't. If you hit something with the bottom of your CB pedals you will release because the bottom of the mech is connected to the top. If you compress the bottom bars, it "opens" the top ones. This is what a lot of people in this thread are mentioning, they are not making this up. Furthermore, shimano pedals are more controlled by spring tension like a ski binding, vs angular rotation with CB pedals. This means that CB pedals WILL NOT release unless you rotate your foot outwards a cerain #of degrees. Shimano pedals are more forgiving in this area, releasing earlier in the rotation with harder effort, or if you pull hard enough, with no rotation. The basic movemen is similar for sure, but they are not the same, nor do they release the same. I've had a similar CB experience to those previously mentioned. Unintended ejections with minor pedal strikes and excessive play developing over time. The deal breaker for me was a broken CroMo spindle on a pair of Eggbeaters. As an endurance wannabe this broke my confidence in them simultaneously. I've moved on to the Time RocAtacs. Not for a weight weenie but I appreciate the more definitive clip in/out. I like the shape of its resin body, seems to deflect you intact (rather than eject you) when you encounter a rock. The quickly-wearing brass cleats are my only gripe.